A brad nailer is an incredible equipment which is generally used for attaching smaller moldings. It is simply a basic version of a traditional finish nailer and available in many different designs in the market. Furthermore, this tool is also utilized for firing brad nails, which are finishing nails having narrow heads on one of its sides. The electric brad nailer is a powerful type of machines that use electricity for its operation. They are quiet, convenient, and faster to use. Moreover, this version of brad nailers is more versatile as compared to the other types. This type of machine is slightly heavier, but it is very effective and complete its job at a much faster rate. Along with that, the price of the electrical brad nailer is on a higher side but proves to be cost-efficient as it demands little to no maintenance from the buyer. Pneumatic brad nailer uses pneumatic air instead of the electricity for powering the gun. It is the traditional type of brad nailer that come in lots of different sizes and capacity to hold several kinds of nails. This type of brad nailer is easier to use and perfect for trimming & woodworks. 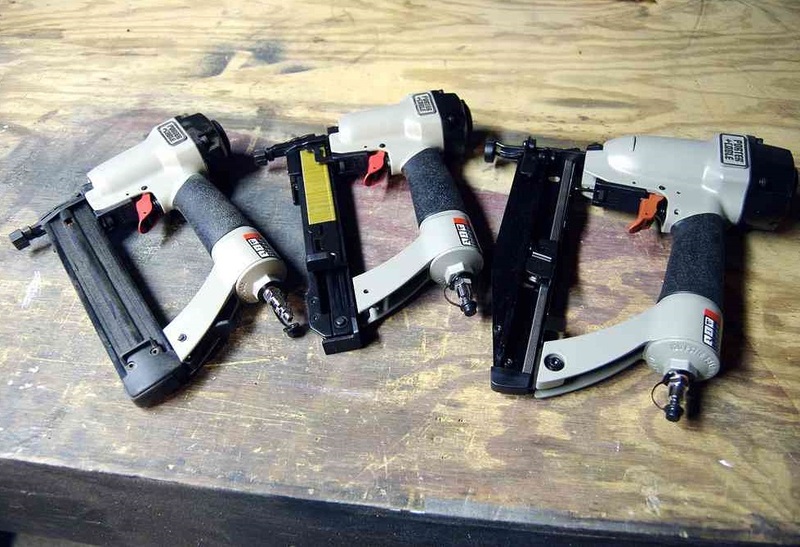 The Pneumatic brad nailer is available in many different sizes and operating methods. So, you should select one that suits your needs and requirements. You should buy the correct adapter that fits your machine. Along with that, shop some pneumatic tool oil and Teflon tape, which will make sure that the connection between the device and the hose is not loose. Teflon tape should be used for wrapping the fitting on the hose adapter before connecting the adapter to the machine. Is it best to test the machine on a wood piece before doing the real job to find out it works properly or not? In order to do it the right way, place the tool in such a way that its tip should rest on the wood board’s surface at an accurate 90-degree angle. Press the trigger so that the brad nail will be allowed to sink in. If the machine works in a correct way, then start doing a real job with it now. Always wear safety goggles or glasses and proper protection to the ears while using this machine. In addition, keep some additional nail strips for completing the job quickly. There are many people who get injured due to improper usage of this machine. That’s why you should keep the first-aid box at hand while operating this machine. Also, follow all the instructions mentioned in the manual carefully while using the brad nailer.